Acrobat is a program from Adobe that lets you capture a document and then view it in its original format and appearance. Acrobat is ideal for making documents or brochures that were designed for the print medium viewable electronically and capable of being shared with others on the Internet. 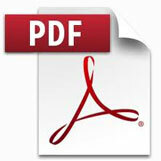 To view an Acrobat document, which is called a Portable Document Format ( PDF ) file, you need Acrobat Reader. The Reader is free and can be downloaded from Adobe. Acrobat is actually a set of products. The latest version includes a “toolkit” that lets you scan in or otherwise capture documents created with Word, Pagemaker, and other desktop publishing products. The resulting PDF files can then be available for viewing either directly with the Reader or they can be viewed as embedded files within the browser.